A review requested by Julia Eastwood, with thanks to supporting Alternate Ending as a donor through Patreon. Longtime readers perhaps recall my abiding fascination with World War II-era Hollywood films, and they don't come much more fascinating than The More the Merrier, a 1943 romantic comedy that could only conceivably take place within the very thinnest slice of world history. The scenario that thrusts the two lovers together is strictly a wartime phenomenon, and the film's tone is unimaginable without our awareness of the very real possibility that the male lead might very well end up dead in a European field soon. For the plot is about a bullying old man smashing two attractive younger people together against their will until they finally decide to have, for no clear reason other than because it amuses him to do so. It's easier to see how that could turn rancid, but the omnipresent (and never once explicitly stated) reality of death during wartime, along with the sense of widespread loss and privation that quietly infects every aspect of daily life, lends a wearily heartfelt, sentimental overtone to the proceedings. It is a gossamer-weight, charming film about how very awful it is to have the war fill every minute of your waking world - I don't know how that alchemy works, but it's sublime. 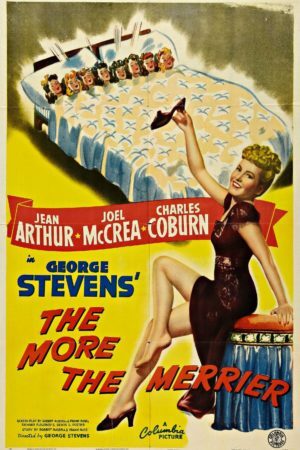 Indeed, The More the Merrier is pretty handily my favorite film about the American homefront in WWII (and I don't think that changes if you remove the word "American" from the sentence), both because of the rather ingenious emotional shading that comes from having that setting, and because the film presents a pretty wonderful document of what was life was like at the moment of its creation. No Mrs. Miniver, this, nor a Since You Went Away, movies that telegraph their artificial movie-ness; this is, first and above all a comic film, and like many a great comic film, its first strategy is to tap into the everyday world exactly as it is, all the better to gently lampoon it for the sake of good-natured humor about how ridiculous life is. Not that I think life was exactly like this, but you start to get a sense of it, in exactly the form of the things that the film chooses to parody. The place is Washington, D.C., which as one might expect is an especially busy American city right at whatever moment we arrive in 1942 or '43. With all the diplomats and other experts moving in and out, not to mention the general resource shortage plaguing the United States, housing has become an unmatched rarity, and this proves to be a particular irritation for Benjamin Dingle (Charles Coburn), a very wealthy expert on something or other (possibly just efficient ways of moving resources from this place to that), who is in town to discuss exactly that same housing shortage with some important men in the government. For in his ruthlessly efficient way, Dingle has arrived two days ahead of schedule, meaning that his hotel suite isn't ready for him. The solution is to find what appears to be the only room for rent in all of Washington, con all of the dozen or so other people waiting to see it into leaving, and then talking over the room's rightful owner, Connie Milligan (Jean Arthur) so quickly and with such peremptory logic that she ends up conceding Dingle the space over her extreme objections to having male housemate, and a rather self-satisfied & rude one at that. Hardly any time later, Dingle rents half of his room to Joe Carter (Joel McCrea), himself without a home for the week he'll be in town before shipping out to war. Connie is furious and wants the men out on the spot, but having already spent Dingle's money, she's stuck with them. Obviously, the film (with Dingle's enthusiastic support) pushes Connie and Joe together, despite their misgivings and her fiancé, boring but safe bureaucrat Charles J. Pendergast (Richard Gaines). But it doesn't do so quickly at all. Among the chief pleasures of The More the Merrier, in fact, is its laconic approach to telling its story, which is true in a number of different ways. It's a remarkably naturalistic film for Hollywood in 1943, the most successful of all director George Stevens's experiments in that vein (which started with 1941's Penny Serenade and would dominate all of his post-war films - The More the Merrier was his final work before joining the Army to head a filmmaking units). That's a key part of the acting, which is maybe why all three of the leads are doing the best work of their careers. Arthur, who I typically do not care for much, is absolutely superb in the way she underplays the film's comedy; it's easy to imagine a version of this film with a flighty, flustered Connie, rather than the merely inconvenienced and awkward-feeling, guiltstruck Connie we actually get, and it makes The More the Merrier considerably more humane, if not maybe as funny, for Arthur to take this approach, and for her efforts, she received her only Academy Award nomination. Coburn, for his part, won an Academy Award on his second of three nominations, and deserved it: he teases out layers of boredom, romanticism, and patriotism from Dingle that are implied but not stated by the script, creating my favorite of all his avuncular, overwhelming old rich men. McCrea endeavors to be adorably nonplussed by the whole thing, which is pretty much the best we have the right to hope for with Joel McCrea. The naturalism in the acting, especially Arthur's leads to a very curious, very interesting trait of the film: it feels like a realist screwball comedy, if such a thing could exist. The '30s were only just over, so it makes sense that the manic, slightly antagonist quality of that decade's best romantic comedies would remain strong, but The More the Merrier lacks the frenzy of those movies. I'm not sure that's entirely intentional - Stevens is not a frenzied director ever - but it does create a terrifically interesting tension between the excesses of the scenario and the calming, normal, grown-up way the film deals with that scenario. "Quit screwing around, there's a war on" is as much the tone of the film as it is the text, and the weird collision of '30s plotting, '40s patriotic morality, and post-war modernist aesthetics is pretty much unique to my knowledge. It results in a singularly grounded film that remains in all ways a bubbly, appealing comedy, and that's just neat as hell however you want to slice it. But I was heading in a very different direction. The naturalism also finds it way into the film's mise en scène, which involves a substantial amount of rear-projected Washington location photography in its mostly successful attempt to capture something of how life exists. This is a film that frequently allows its narrative to simmer over the lowest flame, while giving itself up to scenes of the three leads dealing with the hustle and bustle of the capital city in wartime. This is all done with great affection, leading to some knowing humor of the "you all know how this how life goes, right? Sigh, chuckle" variety; the most probing is the gag where Joe, a rare example of a single man of marriageable age still walking amongst U.S. civilians, attracts young women like moths on a bug light, gaping at him with hungry, hopeful looks - the joke isn't even on them, but on the silliness that so many people have to be single just because of the damned war. And thus does it go back around to being maybe even a touch sad. At any rate, the film's loving, amused look at American city life in 1943, a place of lack but also a place where ultimately, everybody wants to pull for everybody else to succeed, is a lovely thing, happily unhurried. There is a loose rule in writing narrative fiction, honored as much in the breach as the observation, that characters should drive the story, rather than the story happening the way the writer wants whether it's true to the characters or not. This happens less in romantic comedies, maybe, than in any other film genre, with their insistence on formulaic couple formation at all costs; The More The Merrier is one of the few examples I can name of a romcom that really does feel like it's letting the plot develop exactly the way they need it to, not the way the screenwriters require. And as a direct result of that, it's inordinately satisfying, despite some sluggishness across most of its final act (probably not coincidentally, this is also the part of the film that relies on Coburn the least). It's warm and aware of the world without ever giving up its sense of humor or the pleasures of a good contrived fiction, and for its troubles received a comfortable six Oscar nominations: besides the actors, it received very well-justified nods for its story, it's screenplay, and Stevens's directing, capped off by Best Picture. It lost to Casablanca, and it very much should have, but on its own this is still one of the great American films about the war, acknowledging both the sacrifices it demands but also the way that humanity, and a rich, welcoming sense of humor, can still thrive even under such conditions. Simply put, this is one of the most unfairly overlooked films of the war years, and 75 years later remains one of the freshest movies of its era.